I am VERY much looking forward to Fall. Last weekend we purchased the first Halloween costume of the season for the baby girl...she's going to be Tinkerbell and my son, Peter Pan. Should be pretty cute. 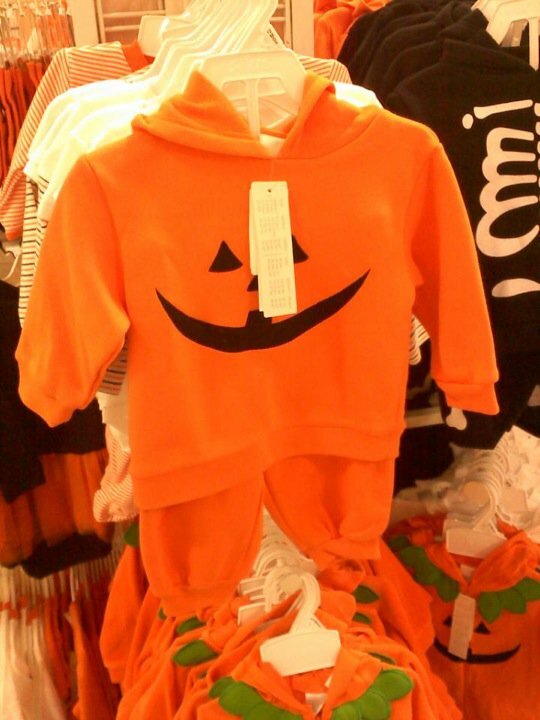 My wife sent me photos via text message last Friday night with Halloween clothes they already had on the racks at Babies R Us. 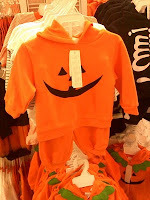 The pumpkin sweatsuit was also picked up along with a Halloween pajama set. As I've blogged about before I enjoy buying the kids clothes to wear during the month of October and I'm hoping this year's offerings are as good as they've been in years past. ...and now...I'm am getting ready to go into full blown Halloween mode. I feel the need to shop and buy all sorts of Halloween things...I'm going to start trolling the stores lurking for Halloween goodies. 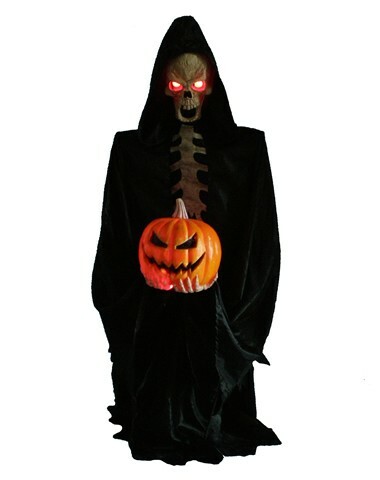 I did order the Rising Reaper I was looking for last year as it was on sale. I'm hoping it arrives in the next month or so. So with that...I'll be starting my annual blitz on eBay with some of the Halloween discs I have available for sale. If you don't already own one, pick one up there, at HauntCDs or email me and I can arrange a sale to you that way. "Within the Haunt Industry there is a large number of companies and individuals producing soundscapes, sound effects and theme music in cd format. The advent of which is one of recent history's most valuable contributions to the industry. Hassle-free sound without the bother of rewinds, broken tapes and distortion caused by wear. Reviewing these products presents a challenge. It is as much a matter of taste as expertise, not dissimilar to trying to compare a heavy metal music track to rap or classical music. What makes a haunt cd good or bad is more the application it is intended for than the product itself. Many well-produced cd's simply will not work in every type of haunt. First a haunter must ask, "What do I want the sound to do?" Is the haunt to be built around a theme that requires a tightly woven sound track to help enhance the storyline? Or, as is often the case, does the haunt need a background soundscape to merely set the tone a haunter desires? If your desire is in the latter category, take a listen to Pumpkinland and Pumpkinland II. The creator of the Pumpkinland cd's does soundscapes and does them well. Built primarily of skillfully layered sound effects, these soundscapes provide a series of background tracks that are eerie, effective and, in some cases very long allowing almost gap-free use. While not as music based as some others, the tracks definitely have a place in the industry. Used in sets such as cemeteries and other outdoor scenes the final tracks of both I and II are superb. 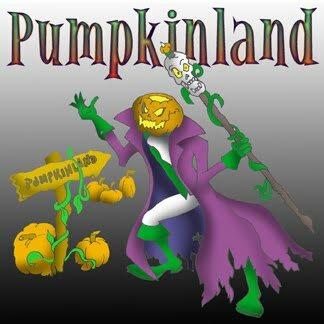 Pumpkinland shows it's true strength in mixes that are tailored for the night with wind, weather and animal noises perfectly balanced whether the application is subtle or at full volume. The variety of tracks on each cd does cover multiple types of scenes however, and haunters will find them useful in many other scenarios. Perhaps the only shortcoming of Pumpkinland is the packaging. It tends to portray a more simple and "Halloweenie" product than is hidden within and may unfortunately "put off" some serious haunters. Don't let it fool you, underneath the somewhat mainstream cover is a product sufficiently dark for most applications and far removed from the "scary sounds" cd's found in retail stores that it unfortunately may bring to mind. While the soundscapes of Pumpkinland may not have the recognizability of music-based haunt tracks, nor are they presented in slick packaging, they are well produced and provide yet another valuable tool to the industry. Take the time to visit their web site (Pumpkinland) and listen to the product. It could well be just the thing you've been looking for." The soundtrack to Fleshrot: Tales from the Dead is a companion to the graphic novel. This CD features 13 tracks of music inspired by the book. The music is a combination of edgy and gritty songs and ambient/soundtrack 'HauntScapes' capturing the feel of the art and stories from the pages of the book. 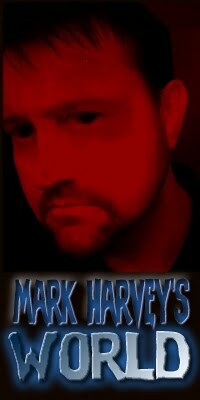 Mark Harvey of Nobody Records has written/recorded/produced the album in association with Frightworld Studios. The CD titled Fleshrot: Songs of the Dead is available NOW! Mark Harvey has been writing and recording music for 17 years. He founded Nobody Records in 1987 at age 18 to promote and release his first LP. He opened Pumpkinland Studios to record various solo and band efforts. In 1999 he released his first Halloween 'HauntScape', Pumpkinland, for use in theme parks, haunted attractions and by home haunters. His work includes commercials, custom haunt tracks, soundscapes and sound effects. His work has been heard on radio, television and film. Now it is time to run away and join the carnival. 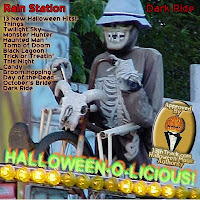 "Step right up and see the amazing, the unbelievable, the available for your attraction CD, Dark Ride by Rain Station." A journey through a veritable midway of new music written for old pretzel rides. The use of sound effects is limited only to those that help create the feel of the piece. The styles of music range widely from Heavy Metal beats through old time Rock and Roll to the almost cutesy Trick Or Treatin. This nostalgically fun selection, took me back to my early days as a young zombie, heading out on Halloween with the lust for candy in my heart. The CD would be great for line entertainment or a party, with a little bit for every taste and some of the beats are infectious.